The Electronic Dance Music community has always been a place for people to come and be their true selves. They throw themselves into a world of amazing music, theatrics and festivals. They live with love in their hearts for those amazing two to seven days of not being nurses, teachers, military, students or any profession for that matter. I mean…This community has changed my life is so many positive ways I can’t even begin to explain. But what happens when we all return to “Reality”? PLURR or Peace, Love, Unity, Respect, and Responsibility has been a way of life for many of us in the community since before we can remember, yet…almost constantly online and at shows we still deal with rough crowds that boo artists for changing their sound, Yeah Getter Fans/Not Fans (Those that showed support not included) I’m looking at you. We still deal with Men (and Women for that matter,) not hearing the word “No”. Artists are being drugged, attendees are being drugged, and the nonstop bullying in real life and online is just out of control. And Yes, Trolling is bullying in all sense of the word. And Yes, I am guilty. Getter made it very clear how he felt and cancelled his tour, support flooded in. A quick google search of April 20th 2018 and you’ll find “The day the music died” for the new generation. All over the place, everywhere we are confronted and reminded that Mental Health in the dance music community is a real and constant issue. Depression, Anxiety, PTSD, C-PTSD run rampant everywhere, not just in dance music, Yet, it seems like no one is listening. What are we to do? Well this may not make sense right now to you the reader…but YOU are the medicine and MUSIC is the conduit. I read A LOT, about mental health, triggers, and healing and when it all comes down to it, music for me is the answer. Well, one of the answers. This article came across my feed the other day and I have read it probably 20 times. Every time I read it, something new presents itself. So, I reached out to the author today and asked to repost it here. She agreed. Disclaimer: This article originally appeared on Medium and can be found here. Fresh Music Freaks was granted express permission by the author Brittany Hunter to repost this article in it’s entirety. Whether or not we are willing to admit it publicly, or even to ourselves, many of us have gotten to a point where existing becomes almost too painful to bear. Some people get help, some people don’t. But other people, hover somewhere in the middle, unwilling to take their own life, but not resolved enough to try to make it better. It was in this grey area where I found myself floating during the summer of 2017. And instead of actively attempting to take my life, I stopped fighting for it, and I stopped trying to self-preserve. I couldn’t understand how my life had gotten to a point where I no longer saw it as valuable to anyone else, not my family and certainly not myself. Nevertheless, I had arrived at a place where I had given up on myself, not actively suicidal, but not really living either. I was treading water and my arms and legs were growing tired and about to give out. I could feel that passivity starting to fall away. I was starting to plan how and when I would do it. I could see how this was going to end and while it terrified me, the fact that an “out” existed was almost comforting. Suffice it to say, I was running out of time. I’ve written before about dancing and music and how they threw me a lifeline when I needed it most. But there was one specific part of that aforementioned music festival in Atlanta where my will to live was given back to me. And as bumpy as the road has gotten in the years since I first surrendered to the music, the spark it ignited inside me has sustained me with new life ever since. Music has had a powerful influence over me for as long as I can remember. As a child, hearing music that resonated with me would always bring me to tears, often making me the target of teasing as I would easily become so overwhelmed with emotion. But music was my safe place. With headphones on, I was in a world where the other kids, and the other adults for that matter, couldn’t hurt me. When things at home were scary or too much for a kid or teen to understand, hiding in my room with music was how I survived. Music has nourished me unlike any other source on this planet. But in the summer of 2017, I had run out of music and the despair I felt during that summer could not be remedied by any song I had ever heard. For most of my life, I have felt terminally alone. I had dealt with some form of anxiety and depression for as long as I could remember and this had caused me to feel isolated from other people. I’ve always been more intense than others and felt things more deeply than anyone I knew could possibly understand. I had developed a sense of shame about this that has always divided me from other people. I didn’t know then, that this was because, for my entire life, I had surrounded myself with the wrong people. That last night of the music festival in September, I stepped into a world full of people who felt like I felt and who hurt as I hurt. And who, there in the warm heat of that southern summer, were desperately trying to heal and overcome their pasts. I had already spent two days at the festival, but this set was unlike anything I had yet seen. The first 48-hours were spent getting hyped up by DJs on microphones riling up the crowds. Above and Beyond, on the other hand, did not speak. Instead, they broadcast typed message across a giant screen large enough for the entire crowd to see, messages of love, and healing, and unity. I had never met any of these people before, but after the night was over, they would feel like family because we were all about to go on a journey together. Yes, Your Soul Is Good. “Yes, your soul is good,” is just a line in a song, but in the span of one evening, it undid three decades of negative thought patterns I had programmed myself to believe. This might sound hyperbolic, it’s just music, after all. But dance music is unlike any other genre(more on that later in the series). It’s a form of therapy so deep, it changes you — so long as you are willing to let go and surrender to it. I had given over parts of myself throughout the weekend-long festival, but Above and Beyond took me on a journey I had not anticipated, one where I confronted my grief but simultaneously saw the beauty in it. My mother suffers from Borderline Personality Disorder and her pain poisoned her heart with anger and animosity. She was cruel and she wanted you to hurt as she did. Violence was not her preferred weapon. My mother used her words to pierce you deeper than any blade ever could. And just when you thought it couldn’t get worse, she twisted the blade deeper. My childhood was engulfed in her insults, constantly telling me I wasn’t enough and that I would never be enough for anyone. This had, unfortunately, laid the blueprint for me believing that love was based on insults and criticism. And it led me to a series of emotionally abusive relationships with friends, siblings, and men. It had never occurred to me that I could be “good” so I always acted as though I was undeserving of any form of goodness. In my mind, I was still that child being chastised and torn apart by others. I could take it from the other kids, but I could not take it from my mother. Yet, there, in the middle of a race track in Atlanta, Georgia, which had been transformed into an aquatic-themed music festival for the weekend, I heard music that finally began to break my mother’s spell. Could my soul actually be good? In spite of all the ideas about myself that had been reinforced my whole life? I looked around me, these beautiful humans were all hurting and they were trying to heal as best they could. I wasn’t alone. The music had brought us together. And it saved my life, at a time when I had already resolved myself to what would have been, a most regrettable and tragic fate. In the middle of their set, I heard what is now one of my absolute favorite songs for the very first time. And it made me contemplate some of my recent decisions. Two months before the festival, I had tried and failed to end my own life. I have never spoken of this to anyone before because it was one of the darkest and loneliest moments of my life. And when I woke up and realized I had failed, I wasn’t relieved. I just wanted it to be over. And without anyone to understand this darkness I was experiencing, life itself felt isolating. But this music changed all that. While I didn’t know it then, this music was about to give me the family and community I had always wanted but didn’t think I deserved. It didn’t all happen in one night, but slowly and surely, the music led me to the friends I have today. And these magnificent humans have accepted and loved me more than I thought was possible. These relationships are so strong precisely because we understand each other’s pain and the important role the music plays in our own healing. These incredible souls are the reasons I am still here and they sustain my will to live every single day. Had I known I was going to meet them that horrible night in July, I probably wouldn’t have ever been brought to so desperate a point, to begin with. It’s hard for me to pick out which Above and Beyond songs have had the most profound impact on my life over the last two years. They have all touched my soul and given me a lust for life I had never felt before. A primary reason for this is that their music does not deny the harsh realities of life. Life is hard and pretending it isn’t won’t get you anywhere. But Above and Beyond finds the beauty amongst the chaos. And instead of suffering, their words and their music incites the listener to dance through it, lest you let the darkness engulf you and swallow you whole. Blue Sky Action, for example, which also played that first night I saw them live, is both tragic and breathtakingly beautiful. It would be hyperbole to say that three musicians completely healed thirty years worth of wounds. And I would be lying to you if I told you that the music fixed everything and that after that first festival, I never faced dark thoughts again. But every time I dance to Above and Beyond, I recommit myself to life — even when it hurts so bad the alternative seems like the best solution. And when the pain and the voices in my head become too much, I know I can find solace in their music. Their music has become my escape hatch when it all feels like too much. Unlike any other musicians ever have, Jono Grant, Tony McGuinness, and Paavo Siljamäki — who make up Above and Beyond — constantly nourish my soul and let me know I’m not alone. 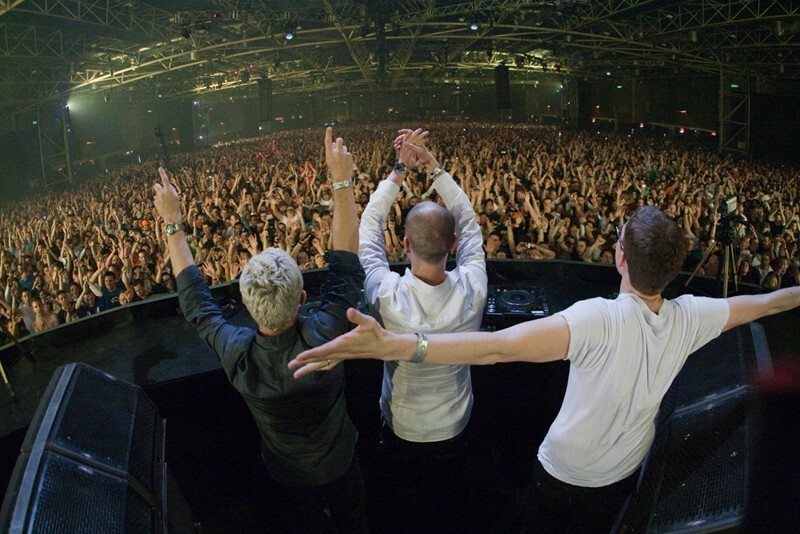 When you go to an Above and Beyond show, you are not just a fan in the crowd, you are a part of something bigger than yourself: you are part of a family. And after having lost my own family, at least to some degree, this community has become my primary support system. “Anjuna” means beautiful in Hindi, which is fitting since Anjunabeats is the name of the label and the community Above and Beyond has formed, though its name is derived from the Indian village of the same name. Each week, their Group Therapy Radio broadcasts songs filled with messages of hope and finding the beauty in the pain and in this human experience that we are all enduring together. And after seeing Above and Beyond that first night at Imagine Festival in Atlanta, I saw beauty in the world for the first time since I was a child. Do not ever let anyone tell you that you aren’t allowed to feel sad. It’s actually quite an accomplishment if you don’t feel sad given how harsh this world can be. You are allowed to feel pain and you are *gasp* even allowed to feel suicidal sometimes. And these thoughts should not warrant you being locked up by the state or chastised or condemned by others. But, if you are dealing with these types of thoughts, I would beg you to reconsider because you are not alone and there are always songs you haven’t yet danced to and solutions you couldn’t see during your darkest nights. I thought I had already heard all my favorite Above and Beyond songs when I encountered the darkness again this Christmas, but my best friend found a song I had not yet fallen in love with and its message once again brought me back to life. End Article Disclaimer: This article originally appeared on Medium and can be found here. Fresh Music Freaks was granted express permission by the author Brittany Hunter to repost this article in its entirety.